My room is a mess. People always meet me and think that I'm super organized. They see that my things for school are well planned and tidy. They see that I'm on time for things. They see that I use a calendar. However, one thing in my life that is a complete mess and I think will always be one will be the cleanliness of my room. In November, I published a blog post called I Tried Spending 5 Minutes Every Night to Tidy Up for a Week based off of Gretchen Rubin's advice. In fact, it even got shared by Gretchen Rubin herself. In that post, there is a very realistic and true before photo of my room. From the post, I saw some comments: "What a disaster of a room." and "I'd never let it get to point A in the first place!" And yeah, my room is a mess. I can attest to that. This is why I'm going to try and change that by tidying up. I am in no way the kind of person that can maintain a clean room. I know some friends that say that they can't even study unless their room is clean, which is something so foreign to me. What is more foreign is the way that Marie Kondo describes her interest in tidying up. For me, I just don't have the same interest as her and it is something that I cannot fully understand, which is clearly represented by the mess that my room has. However, I need to go one step at a time and cannot expect myself to transform into a tidying queen like Marie Kondo overnight, which is why I'm starting with my closet. Baby steps right? I think that the main reason that I do not get rid of things is because I a) think that I might need them in the future, b) feel bad getting rid of them because I spent money purchasing these things that are still in very good condition and c) want to do more with my things than just throwing them out. Getting started was where I immediately was unwilling to cooperate with Marie Kondo's methods. One of the things that she mentioned was to "place every item of clothing in the house on the floor." My sister had done the KonMari method a couple of months ago and I witnessed the mess that she made when she dumped her entire wardrobe on the floor. It was then and there that I realized that I probably have a ton of clothes. I actually said, "Whoa, you have a lot of clothes. Does this mean that I have this many clothes?" With the carnage of her tidying in mind, I decided that I would opt out of dumping all of my clothes on the floor and instead I would simply adhere to the discarding process, but instead of taking everything out at once, I would just go section by section. However, I didn't completely deviate from the KonMari method, I used her famous "does it spark joy?" selection criterion for deciding whether or not to get rid of or keep a piece. So I went through all of my clothes based off of the clothing type. I went through tee shirts, sorted them, and discarded all of the ones that didn't spark joy anymore. Then I went through sweaters. And pants, and dresses, and so on until I had sorted through my entire closet. I did the same with the general clutter in my closet. 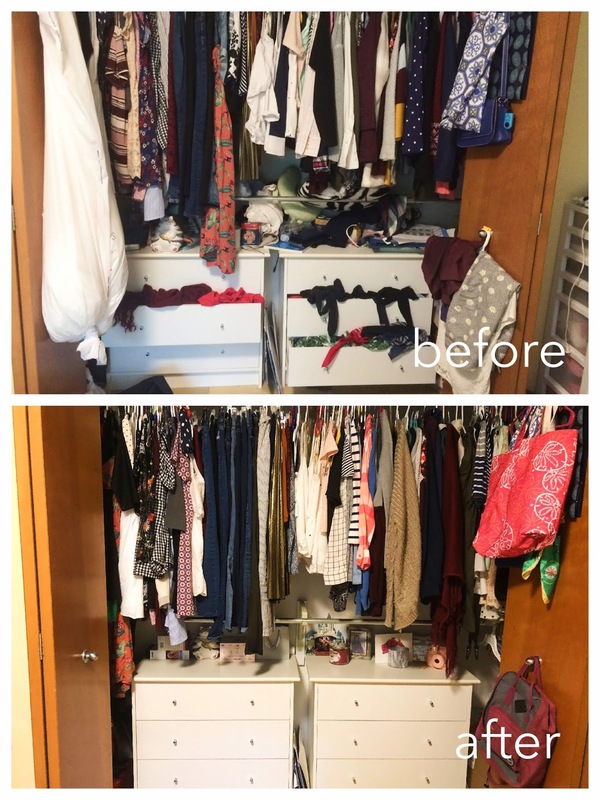 I had a lot of old jewelry and clothes that had fallen off the hangers that were just taking up room in my closet and making it look really cluttered. While I was hesitant to get rid of a lot of my clothes, the "spark joy" method was actually a really great way of looking at things. It was a good reminder that items can be temporary and once they have served their purpose (sparking joy at the moment), there is no harm in saying farewell to them. It helped me get rid of so many clothes, like so many (a giant garbage bag + more worth of clothing). My closet is pretty long, which means that there's lots of space for hanging clothes. This means that the majority of my wardrobe is hanging. One of the things that really tripped me up was the idea to "arrange your clothes so that they rise to the right" with "heavy items on the left side of the closet and light items on the right". I was a little confused by this. In the book it mentions something about it making you feel calmer. However, I am not the kind of person that likes change. The order of the clothes in my closet have been carefully crafted and adhered to for the past few years, so when I changed up the order, it really threw me for a loop. Everything just felt wrong, out of place. Maybe I was simply unwilling to accept change, but looking at my closet, it really didn't make me feel any happier or calmer. It just felt odd. I sat there, thinking about how if I kept ignoring what the Konmari method said, was I really following it? A specific quote from the beginning of the book kept ringing out: "Don't change the method to suit your personality." And it made me wonder. In order to be tidy and happy and experience the "life-changing magic of tidying up" would have to follow the book to a T? I couldn't help but feeling like I was looking at this book like a bible, like it was simply commands that I needed to mindlessly follow in order to achieve a promise of a happy and tidy life. And I didn't want to feel like I was just doing things because the book told me to. So I made the executive decision to return the order of my clothes to the way that they originally were. The second that everything returned to normal, I felt at ease. This was the way that things were meant to be, at least that's the way that I felt. And who am I to deny my own feelings? So after my hanging clothes had been sorted through, organized and eventually reorganized (or un-organized? ), I needed to get to the rest of my clothes, which were all of the clothes in the drawers. The main thing that the Konmari method says about folding clothes is that a) it's preferable to hanging up clothes, b) you shouldn't pile or stack things on top of each other, but rather put everything in a vertical position so your clothes are standing up instead of sitting on top of each other. The idea of putting everything in a vertical position sounded like a really good idea to me. Whenever I go in my drawers, everything always comes unfolded whenever I dig down to the bottom to get something. I could already see it, having my clothes vertical would mean no more digging to the bottom. When I started folding my clothes and putting them in the vertical position, I was shocked to how much space I actually cleared. In fact, I managed to fit what used to be 4 drawers of clothing into slightly over 2 drawers. I think that it was partially because I had discarded a lot of my clothes, but I also think that the vertical method allowed me to pack more clothes into one drawer. The clothes were folded more tightly because they weren't coming undone whenever I reached in and they could really get nice and snug. My drawers were looking neater than ever and when I went to grab a shirt, I didn't mess up the entire drawer in the process. It definitely felt like a victory. On top of that, since I had so much extra room in my drawers, I managed to put some containers holding jewelry and nail polish into my drawers. They had previously been on top of my drawers, but since I had the room, I could use it to store other things besides my clothes. It was a double win. On the other hand, once I got to the underwear drawer, I was starting to feel a little skeptical. 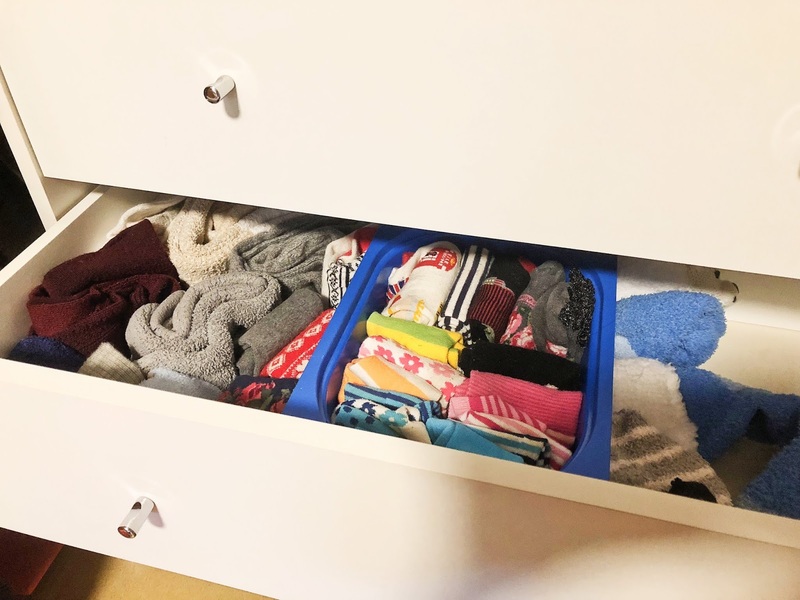 The KonMari method suggests that you don't ball up your socks, but rather fold them exactly the same way that you would fold clothing: fold it normally and then put it in vertical storage. And that confused me. I was thinking that if I didn't ball up my socks, wouldn't they separate and I would end up losing a lot of my socks? I was very skeptical and almost 90% sure that I wouldn't like that method, but I decided to give it a try anyway. However, when I started getting a few pairs of socks into the drawer, I realized that it actually worked. With the vertical storage, the clothes were packed so tightly that the socks stayed in pairs perfectly. In addition, unlike stacking clothing, I wouldn't disrupt any of the socks to the point that they would lose their partner. I guess that if you don't have to dig through your drawers, the socks won't get pushed around to the point that they would separate from their match. Moreover, just like with the clothing, the folding method shrunk down the amount of room that the socks took up. At first, my socks were just lying around taking up the majority of the drawer, but after folding them, they took up less than two-thirds of the drawer. It really helped me to save room, which I found to be absolutely amazing. I did see a difference between the before and after. Before, my clothes were folded so poorly that they kept coming undone, which took up more space and consequently made it difficult to open and close drawers because they were overflowing. I managed to clear most of the clutter effectively using the "spark joy" method and made room for things that mattered more to me. 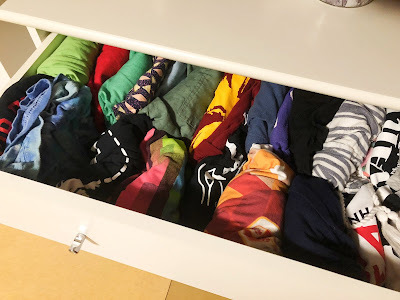 My favorite thing about the Konmari method is absolutely the folding method. I was blown away by how well-organized, functional, and compact the vertical folding method was. It made me rethink what I had been doing before. Every time I go to pull something out of the drawer, it blows my mind again that the drawer can still be perfectly tidy even after I've removed something. I am still feeling a little skeptical over having to adhere to the KonMari method to a T. I think that there are some things in this book that I just don't like doing, whereas there are also some points that are very valid and worth giving a try, like the folding method. I guess that my takeaway is that there's no harm in trying them out and if you don't like them, no harm either. Want to see the visual results and changes more in depth? I made an IGTV video that accompanies this post that goes into depth of the actual tidying process. I read Marie Kondo's book for a choice book in middle school. I wish I thought to try out her method for myself. I instead presented on ways in which we could implement some of Marie Kondo's strategies.